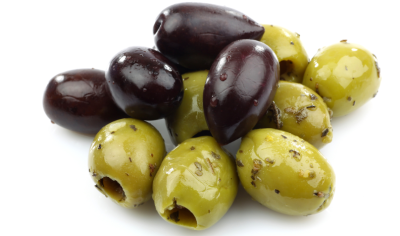 There are so many different varieties of olives, but they do have one thing in common; they are good for your skin! I personally love Spanish Olive tapenade. It’s a delicious and easy-to-make spread that you can use as a dip, sandwich (vegetarian) spread , or topping for fish and poultry. Olives are a good source of the antioxidant vitamin E (especially black olives), and they also contain an amounts of antioxidant minerals like selenium and zinc. Vitamin E has been shown to protect skin from ultraviolet radiation, thus guarding against skin cancer and premature aging. However, it’s the phytonutrient content of olives that makes them unique as an antioxidant-rich food. For all you weight watchers out there: One cup of olives (120 grams) contains about 130 calories. Other beneficial sides of Olives are; healthy eyes, good ource of iron, lower cholesterol, stronger hair, reduce the risk of skin cancer (no hard evidence), Anti-Inflammatory Benefits.